It’s easily possible with MagicPicker! In the Color Temperature Wheel mode switch on Tone Lock and start shifting the slider on the wheel. This option lets you quickly find corresponding colors having the same brightness for lights and shadows or for foreground and background. Or keep the same brightness level across the surface when editing textures. Extension Manager for Adobe software is out of beta and is free! Install, Remove, Update, Manage any extensions on Adobe Creative Cloud & Creative Suite easily! 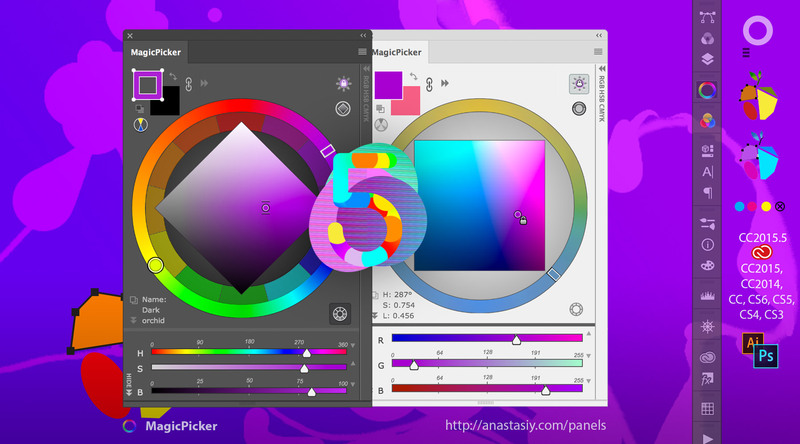 Anastasiy’s Extension Manager is finally out of beta and is free! – Windows & Mac OS X compatible – native app for both platforms! Author AnastasiyPosted on April 6, 2016 April 6, 2016 Categories NewsTags Adobe, CC, cc2014, CC2015, Cloud, Creative, creative cloud, Creative Suite, CS5, CS6, DiskFonts, Extension, Install, MagicPicker, Manage, Manager, MixColors, panel, Plugin, Remove, Suite, Update4 Comments on Extension Manager for Adobe software is out of beta and is free!